PALM COAST, Fla. - Purists be damned: Sometimes, bulldozers on golf courses are good. Sometimes you have to go around nature to truly appreciate it, and what better way to get around nature - or through it - than with giant, earth-rending machines? The Atlantic forms the backdrop when you tee off at Ocean Hammock Golf Club. That's why we should all be happy Jack Nicklaus, a man never afraid to move heaven and earth, mainly earth, got out the heavy machinery at the Ocean Hammock Golf Club. The Nicklaus course at Ocean Hammock was advertised as the first true oceanfront course to open in Florida in more than three-quarters of a century (though they may want to check with the Ocean Links folks at Amelia Island Plantation). Still, in condo-crazy Florida it's possible to have an oceanfront course where you can't see the ocean, and what good is that? That's where the bulldozers come in. Nicklaus used them to build elevation into the tees and greens at Ocean Hammock, lifting them above the dune line and lifting this course into the realm of the sublime. To play Ocean Hammock a perfect Florida winter day - jet contrails lacerating the clear, blue sky; perfect little waves barreling in from the bright, blue ocean - is to know God and Donald Ross are in heaven and all is right with the world. "Wow," said Rusty Green, a single-digit handicapper from Jacksonville who had wanted to play this course for years. "Spectacular." Yes indeed. 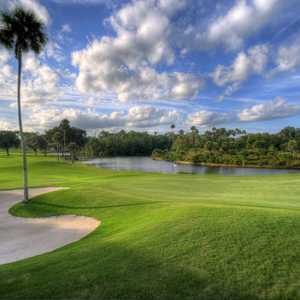 This is what Florida golf should be all about, taking advantage of the state's bountiful, sub-tropical scenery in all its glory. You first get a glimpse of the big pond on No. 1, just beyond the palms that front the growth-covered dunes. That's just the appetizer: No fewer than eight holes play along the ocean. You can hear it, smell it and - crescendo now - see it. It may seem funny to say it in a state with hundreds of miles of coastline, but to actually see the ocean from a Florida golf course is quite a treat. So, the views are stunning. What about the course itself? It pretty much matches the scenery. Ocean Hammock stretches to a tad over 7,200 yards with a rough-and-tumble slope rating of 147 (yikes). More important, though, it's a course that requires imagination, much like its designer displayed during his days on the PGA Tour. "It's a shot makers' course and you have to be creative," said Head Professional Mary Hafeman, a Curtis Cup veteran. 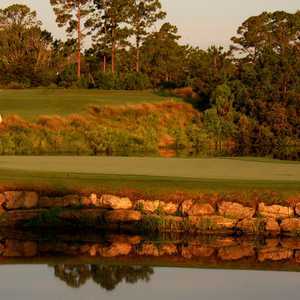 "It's an unusual course design for Florida, with all the dunes, pampas grass and waste areas. It's very playable, and it's kind of links-y because of all the uneven lies. Nicklaus did a great job. He gives you the wide fairways with multiple routes to the greens, and you have a choice of how to play the greens, to roll it up or come in from the air." True enough, though neither route is easy. Because of their elevation, many of the greens drop off in a very nasty manner, and some of the collection areas have echoes. Getting up and down here with any semblance of dignity can be a trying affair, great views or not. Not everyone believes it's a Nicklaus design when they play it, but many of his design traits are there. Nicklaus has always liked his deep bunkers, owing to the Scottish influence, and he's got 'em here. And not all the fairways favor his trademark fades; in fact, most of the doglegs are right to left. Ocean Hammock is open to guests of the lodge and to the public, though it is anyone's guess how long that will remain so. And you'll pay for the spectacle: Green fees run to the $200 mark during the summer and jump up to $265 during the peak seasons. Still, you get a course with nonpareil views that can withstand repeated play without getting old - especially when the wind blows, which completely transforms the character of the layout. "I'd be hard pressed to think of a better course in the area," said Green, a veteran of First Coast courses. 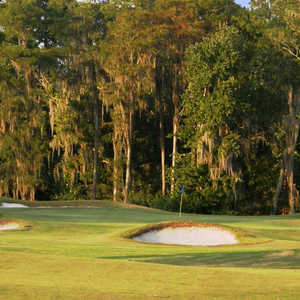 In spread-out Jacksonville, location is the key in lodging; it can be difficult getting around to the courses on the First Coast. There are a couple of good places to stay near Interstate 95, which will take you north or south, and Butler Boulevard, which heads east to the beaches. The Best Western is at the intersection of I-95 and Butler, eight miles from downtown and about 15 miles from the beaches. The six-story motel has in-room, high-speed Internet access, free continental breakfast, pool, fitness center and sauna. It also has meeting space that can handle 150 of you business types. The Hilton Garden Inn is another good, centrally located place. It offers free in-room Internet, a business center, whirlpool and a fitness center. The rooms have microwaves and small refrigerators. There is any number of other accommodations in the area. The Hilton has the Great American Grill restaurant, which serves breakfast, and there are a bunch of restaurants within walking distance. One of them, the Seven Bridges Brewery, provides room service to the hotel (try the flame-grilled meat loaf). Also nearby: Don Pablo's, Tony Roma's, Jacksonville Ale House, Jason's Deli, Copeland's and the Gallery Bistro. Despite the high slope rating from the back tees, women should enjoy the course because of its relative lack of forced carries. Veteran golf writer Tim McDonald keeps one eye on the PGA Tour and another watching golf vacation hotspots and letting travelers in on the best place to vacation.